Bibbidi Bobbidi Bomb! That’s precisely what the most current adaptation/remake of the timeless classic is. Watch as everything you loved about the original Disney Classic is sucked out of this version. But, after this same tired story has been remade again, and again, and again, and again, what can you expect??? From the casting–with Cate Blanchette being the exception–to the writing to the over all poor execution of the famous fairy tale, you will understand why Disney had to add the Frozen short film prior to the opening credits just to get people to see this travesty unfold. On that note, it too was poorly produced and shoved down the movie patrons’ throats. After the tragic adaptation of the beloved Into the Woods, laughable revisionist Sleeping Beauty/Maleficent, and this year’s flavor of Cinderella, I am fearful of the upcoming live-action remake of Beauty and the Beast. Ordinarily, this is where I summarize the plot; however, this story has been remade so many times that I won’t bother. But, I will tell you that in an effort to add some new zest to the story, Disney does modify some of the events and adds in additional backstory. And, I will say that I liked the modifications and additions. So, I suppose the whole thing wasn’t a total flop. One of the cardinal rules of filmmaking: don’t remake a classic and virtually change nothing! Your audience will most likely be bored to tears. It was Cecil B. DeMille who said, “the greatest art is the art of storytelling.” Unfortunately, the storytelling in this movie was not artful or original at all. And I use the term original lightly. I’m aware that many films are based on other works of literature or plays. However, it is vitally important that, when adapting a work of fiction, adding something new is required. Nobody wants to see the same thing over and over. Good examples of creative twists on the Cinderella story were Ever After, with Drew Berrymoore, and the funny, entertaining Cinderella with the beautifully talented Bernadette Peters. Both these versions took the familiar story and created something new. Speaking of Ms. Peters, I have yet to understand Disney’s blatant aversion to casting her in roles that are made for her, such as the witch in the recent Into the Woods and the role of Godmother in today’s Cinderella. Another excellent choice for Godmother would have been the incomparable Michelle Pfeiffer. On the note of casting, I am overall very disappointed with the performances. I will directly point out that I am very happy that Disney chose Lily James for the iconic role of Cinderella, because she boasts a very natural beauty that is not typical of those ordinarilly chosen to play–or drawn to play–Disney princesses. She is someone girls could look up to and not feel like they could never measure up to the unrealistic Disney princess image that often graces the screen. Another positive casting choice was Blanchette as Lady Tremaine (stepmother). She played the role with excellence and truly brought the character to life. At first, I wasn’t too sure about her when the cast was initially announced; but, I stood corrected when everything from her look, to her tone of voice, to her attire screamed ‘I am the evil stepmother.’ She took the Disney villain to a whole new level with the addition of taunting and belittling. As far as the rest of the cast, yes–including Helena Bonham Carter (as Godmother)–I am very disappointed and was constantly thinking of who else should’ve been cast in the various roles. Pacing is very important to the structure of a screenplay, and the pacing was way too quick for this story. There were many times that it felt like key turning points or plot twists were just glazed over for the sake of runtime. Another area that structurally suffered was the very ridged narrative. It’s like we jumped from scene to scene without well-crafted transitions. An example of this is when Lady Tremaine has Ella’s glass slipper. We are never even given any clue as to how she thinks to look for the iconic shoe. One of the elements that made Ever After such a hit when it came out was the writing and casting. It took a story most people are familiar with and came at it from a whole new angle. This angle allows the storytellers/filmmakers to include what was loved in the more fictitious fairy tale and build upon it to being the story as close to reality as possible. 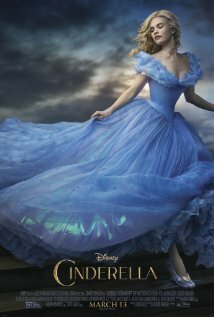 Between the narrative structure and the casting, this live-action Cinderella still remains a favorite by many. Likewise, the (also Disney, by the way) movie musical adaptation of Cinderella in 1997 made its mark on the classic tale/broadway show by giving it an impeccable cast and adding new musical numbers (“Falling in Love with Love” being a fantastic addition). As you can see, both these movies (as well as Into the Woods and the other Cinderella adaptations over the years) often put their own spin on the story to essentially create a new experience for the movie audience. I find that this version of Cinderella failed to create something new and simply rehashed poorly what has already been done. Note to Disney: Disney, you need to try something new! Please stop your current trend of creating live-action versions of your beloved animated movies that made you the king of the industry that you are, because you are losing sight of the art of storytelling. I really hope this live-action adaptation of the animated movie is not a foreshadow of what we are to expect with Beauty and the Beast. At this point, I wouldn’t be surprised if they do not cast Angela Lansbury as Ms. Pots–and no one can play that role like she can. Movie go-ers beware: this is not your childhood Cinderella. It seems that these live action remakes have gone from horrible to inoffensively pointless. I agree with you. I think we are witnessing the crossing over from art to just business because that’s the only explanation as to the plethora of remakes. Are you planning to review any Pfeiffer Pfilms? I wasn’t planning on it, but I could review her role as Catwoman or the witch in Stardust.